This year summer has surprised us. It begun in May and flowers have been blooming quite early and rapidly. In spring I decided to try grow anemones, because they are one of my favorites. I did it as I could and I am so happy I have few blooming at the moment. White, blue and fuchia. 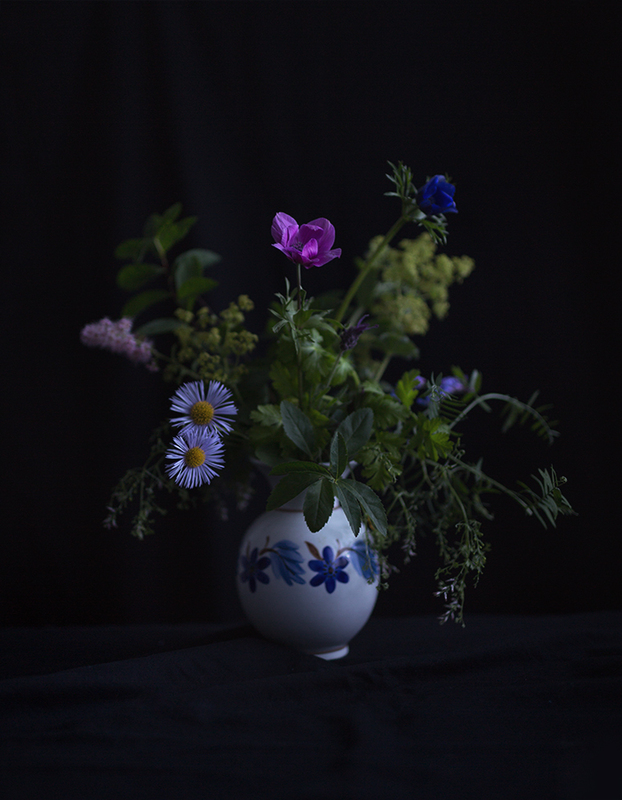 I gathered flowers from our garden this evening. I also borrowed few from our upstairs neighbour's flower bed. I just wish summer would stay longer with us and these flowers too. The vase is from my mom's home and I remember it from my childhood. I remember huge garden with strawberries, different kind of berries like red currant, apple and plum trees with lines of carrots, peas and potatoes. Lots of flowers. I remember I said that I never will have a garden because it is so huge work! We use to help our mom with garden - she paid us a little money for it. But never say never - now I have a garden and I love it.